This Tampa FL home owner had a repeating stain caused by regular wear in the same area of her carpet. She was thinking of replacing it but thought she would have it professionally cleaned in hopes of keeping it for a few more years. This stain developed due to a workout routine that took place in the same spot several times a week. 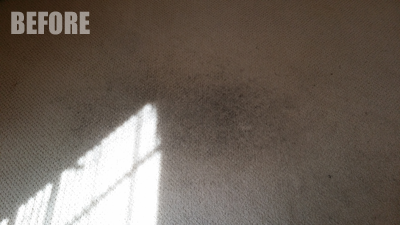 The repeated wear from her workout shoes developed black stippling on her carpet, as seen in the before picture. It also compressed the carpet fibers making the spot stand out even more. With Chem-dry’s carbonated solution, The Natural, we were able to remove the stain and add lift to the carpet fibers again. The repeating stain is gone and the carpet looks brand new. In the after picture you can see the color has returned and carpet is no longer compressed. 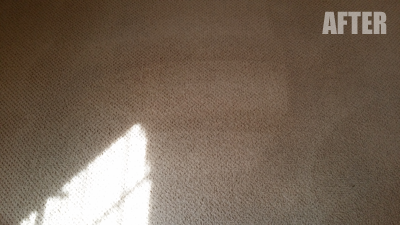 With regular professional cleanings from Chem-Dry of Tampa FL your carpet can be renewed and made healthy again. Don’t let repeating stains keep you from enjoying your home, let Chem-Dry of Tampa bring them back to like new condition. Call Chem-Dry of Tampa to get rid of your repeating carpet stains.